If you don’t already know, Facebook is changing all profiles to the timeline format on March 30th. We are taking this opportunity to give the Zoëtry Wellness & Spa Resorts Facebook pages a facelift to make them even more appealing for our fans. Though this change can be a bit intimidating at first, we want to help ensure that our pages still have the “community” feel that you have come to know and love. We value the opinions of all of our fans and want our pages to continue to be a place where you can find information, ask questions and interact with us on a personal level. Here are a few key facts about timeline that we think will help you better navigate the new look and feel of our pages. 1. Cover Photos: As soon as you come to our pages, you’ll notice a large photo at the top known as our cover photo. Since Facebook timeline is now very visual, this section gives us a chance to show off our beautiful properties! Feel free to take this image and use it as the cover photo on your Facebook page. We want to see how much you love our resorts through the use of one of our cover photos! 2. Posting to Our Timeline: When you post to our timeline, your post will no longer go immediately on our wall. Instead, it will go into a small box called “Recent Posts by Others” in the right hand corner of our page. If you click on one of the comments, you will open up a window, which shows all posts and you’re able to scroll through them. There’s no need to panic with this new feature. We’re still able see all your posts and will respond to them as we normally would! 3. Seeing Only “Posts by Others”: By default, Facebook will always show “Highlights” on our timeline meaning it will only display posts by us. 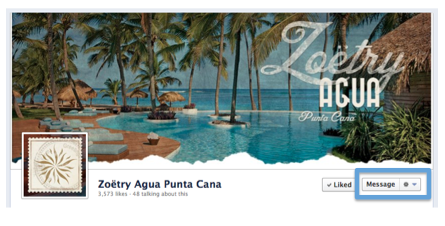 For example, if you are on the Zoëtry Agua Punta Cana page—you will automatically only see posts by Zoëtry Agua until you start scrolling past the current month. However, if you’d like to interact with our page similar to how you did in the old format and just see posts from fans, simply change the drop down to “Posts by Others.” You’re also able to filter timeline to view friend activity, which will just show posts from your friends, and posts by page, which will only show posts from Zoëtry Paraiso. 4. Message Us: Great news! 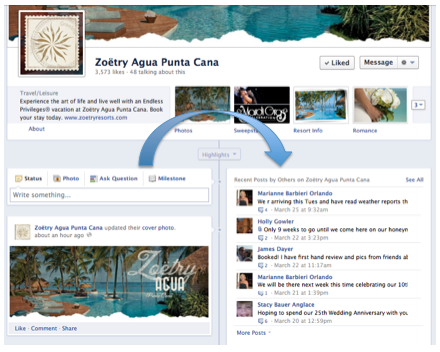 You can now message our pages directly by clicking on the message button at the top of our timeline. If you have an issue or question and do not publically want to post it on our page, feel free to reach out to us here. We’ll respond as quickly as possible. 5. Photos, Tabs & Sweepstakes: Our photos, tabs and sweepstakes have now moved from the left hand side of our page under our profile picture to the top of our page under our cover photo. Our photos, tabs and sweepstakes will all function just as they did on our old Facebook page. Simply click on whichever box you’d like and you’ll see its content. This entry was posted in Zoëtry Wellness & Spa Resorts and tagged 5 tips for Facebook timeline, Facebook Timeline, Facebook timeline is here, How Facebook Timline affects you, how to navigate Facebook timeline. Bookmark the permalink.